26 photos of a variety of ships at Barrow since 2013 including three corvettes rejected by Brunei, Danish train ferry Sjaelland (since scrapped), nuclear fuel carriers Pacific Heron and Pacific Grebe, Oberon class submarine HMS Onyx (since scrapped) and Astute class submarine HMS Artful(?) as well as fishing boats and gasfield support vessels. Also two photos of Barrow-built midget submarine HMS Stickleback. now preserved. Nakhoda Ragam class corvettes, Barrow-in-Furness, 2 February 2013 1. Offshore patrol vessels built by BAe Systems at Scoutstoun for the Royal Brunei Navy who decided not to accept them despite, after a dispute, having paid £600 million for them. They have been laid up for sale at Barrow since 2007. 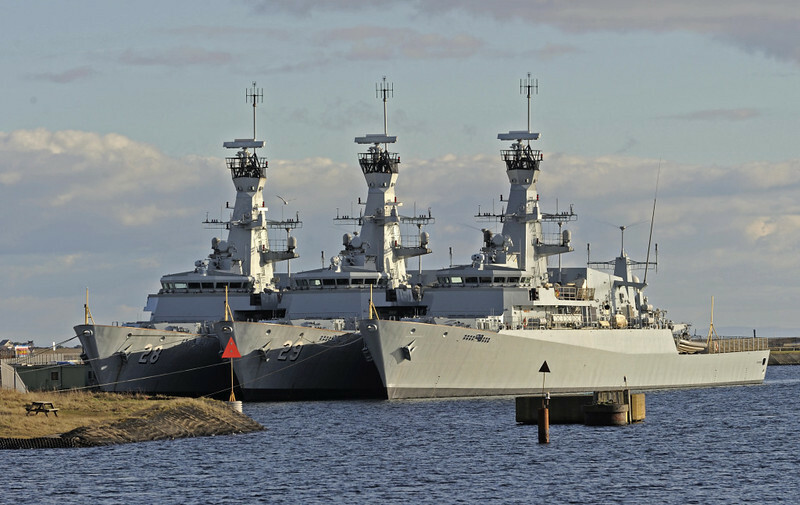 In 2012 it was reported that Indonesia would acquire them for a fraction of their original cost - NB that the ship at right has had its Brunei pennant number (30) removed. They are equipped with Exocet and Sea Wolf missiles and a 76mm gun, which has been removed.